Henry Fleetwood, in the ensuing year, conveyed the estate to Robert Bowyer and Richard Fusse, of London, who were probably only trustees, for they re-conveyed it on the 4th April, 1604, to (Sir) James Altham, Serjeant-at-law, son of James Altham, lord of the manor of Buckland, in this County. 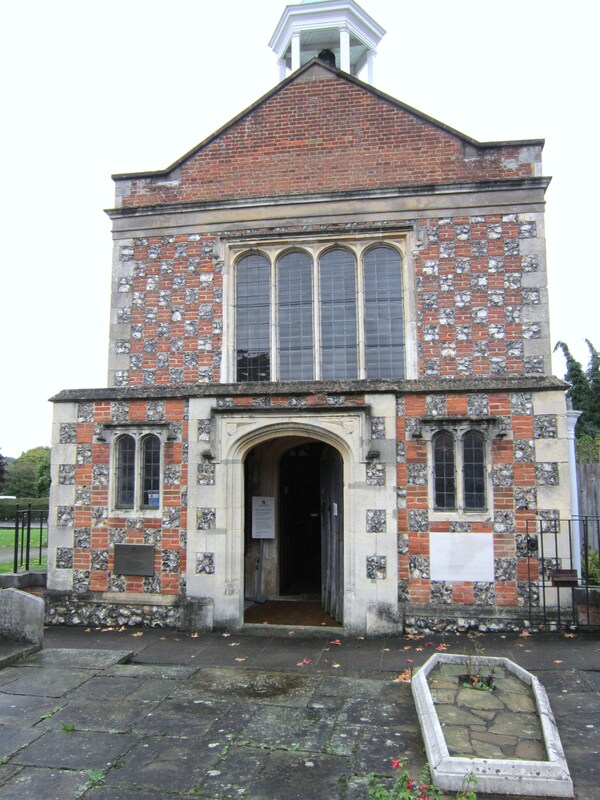 Sir James Altham, who was knighted in 1607, built the present Oxhey Chapel, in which is a monument to himself and his third wife. He died in 1617, and was succeeded by his son, Sir James Altham, Knt., who, by Elizabeth Sutton, his wife, had issue a son, Sutton, and two daughters, Elizabeth and Frances. Sutton Altham was but six months old at the time of his father’s death, in 1623, and himself dying in his eighth year, his sisters became co-heirs. Elizabeth subsequently became the wife of Arthur Annesley, second Viscount Valentia, and first Earl of Anglesey; and Frances was married to Richard Vaughan, second Earl of Carberry. They joined in conveying this estate, on the 15th July, 1639, to John Heydon, of Lincoln’s Inn, grandson of the Francis Heydon who had sold it in 1601. On the 9th of June, 1668, John Heydon re-sold it to Sir William Bucknall, Knt., of whom mention has been already made. His son, Sir John Bucknall, who succeeded him, pulled down the old mansion, known as St. Cleere’s in 1688, and on its site erected a large square building of brick, which, according to tradition, had a hundred windows on each side. In 1799, this mansion was in its turn demolished, and the materials sold by the Honble. William Bucknall. From the family of Bucknall the estate descended concurrently with the manor of Wiggenhall, until it came into the possession of the Right Honble. Thomas-Sotheron Estcourt, by whom it was sold on the 11th July, 1866, to the Right Honble. William-Henry Smith. At that time the estate included 1275 acres, but nearly 200 acres were subsequently cut up in building lots, and when, on the 3rd July 1872, the estate was again offered for sale, it comprised but 1094 acres. The estate remained in the market for five years, and in 1877 was sold to the late Thomas Blackwell (of the well-known firm of Crosse and Blackwell, of London), who died in November, 1879, and by whose representatives it is now held. About midway between the stations of Pinner and Bushey, about half a mile west of the railway, is to be seen a small brick building, nearly covered with ivy, with three large Scotch firs at its eastern end. This is Oxhey Chapel. It now stands alone in a meadow, about a hundred and fifty yards east of the farm, known as Oxhey Place. The old Oxhey Place, mention on page 174, stood between the farm and the chapel. The chapel is a small oblong building, about thirty feet long and fourteen feet wide, lighted by two plain windows on its south side, and one over the door at the west end. The reredos, if such it may be called, occupies the whole eastern end, and reaches nearly to the ceiling. It is of wood, elaborately carved in the upper part, and is a good specimen of early seventeenth century workmanship. It is divided into three compartments by two massive twisted columns with Corinthian capitals, supporting a frieze, cornice, and pediment. In the centre compartment, between the pillars, is the Decalogue; on the north side is the Lord’s Prayer; and on the south, the Apostles’ Creed, in gold letters on a black ground. The tiny altar table is inclosed (sic) within a wooden railing apparently of a somewhat later date than the reredos. On the south wall, between the windows, is a large monument to Sir James Altham and his third wife. The figures are kneeling under semicircular niches; the knight in front, habited in his judicial robes, and behind him his wife, in a black dress, with a wheel-farthingale, and a large ruff. The head-dress is similar to the illustration given on page 186 of the Hundred of Hertford. Above the figures is a canopy of alabaster, supported by three columns of black marble, their capitals gilt, surmounted by a frieze and pediment, on which is a shield thus charged:- Quarterly of 4; I. and IV., Argent; a Lion rampant sable: II. and III., Paly of 6 ermine and azure, on a Chief gules a Lion passant guardant or. THE MONUMENT OF SR JAMES ALTHAM KT ONE OF YE BARONS OF YE ESCHEQ. 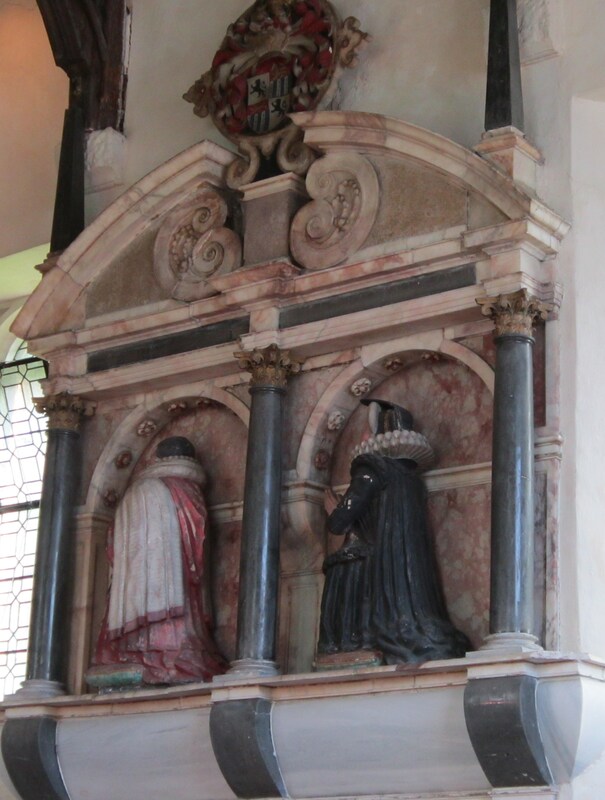 FOVNDER OF YS CHAPPELL & OF DAME HELEN HIS LAST WIFE, FORMER WIVE TO JOHN HYDE LATE CITTIZEN & GROCER OF LONDON HE WAS THIRD SON OF JAMES ALTHAM ESQ WHO LYETH INTOMBED IN YE CHAVNCELL OF LATTON CHURCH, IN ESSEX HE HAD 2 FORMER WIVE YT WERE BVRIED AT LONDON (WHERE THEY LIVED WITH HIM & DYED 2) BY YE FIRST WIFE HE HAD ONE SON, BY YE SECOND ONE SON & 3 DAVGHTERS, BY YE LAST NO CHILD. YS LADY WAS YE DAVGHTER OF JOHN SAVNDERSON, LATE OF LONDON, MERCHANT, & DID BEARE TO JOHN HYDE HER FORMER HVSBAND 7 SONNES & 10 DAVGHTERS. Near this Monument are deposited the Remains of JOHN ASKELL BUCKNALL Esqre Whose Conduct, thro’ a long Course of Years Evinced the Sincerity of his Religion, The Mildness of his Manners, His true Patriotism, And unfeigned Virtues. Having lived an Ornament to his Friends, And the Protector of his Neighbours; He died the 25th August, Anno Dom. 1796: Aetatis 78. In Memory of a much-loved Uncle and as a mark of their Gratitude and Esteem; His Relations, sincerely lamenting his Loss, Have erected this Marble: Anno Dom. 1797. ARMS beneath:- Argent; two Chevronels gules between three Bucks’ heads caboshed sable, attried or, for BUCKNALL. 2 The words in brackets I take from Clutterbuck. They are now quite illegible.